Isn't this backpack adorable? There were a lot of these being posted a year or so ago, which is when I made this one. One reason that I'm posting it now (besides the fact that I finally have a blog!) is that the Sweet Always Designer Series Paper used on it is currently on the Clearance Rack - for only $3.99 a package!!!! Of course, this is only while supplies last, but even if you don't have this paper, this backpack would look adorable with any of Stampin' Up! 's designer papers. The base cardstock is Chocolate Chip. The accent flowers are from the Flower Fusion felt flowers (pg. 180 IB&C) with miscellaneous colored brads in the centers. The felt flowers are one of this year's "Last Chance" items and will be retiring at the end of June. The ribbon on the back for the handles is our 5/8" Chocolate Chip grosgrain ribbon. 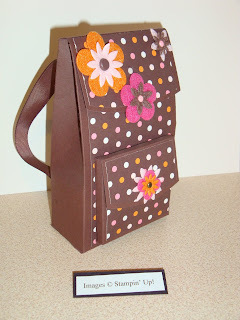 I got the pattern for this backpack from my friend Brandy who was gracious enough to share her instructions with me. If you would like the pattern, please contact me and I'll look it up and see if I still have it saved on my computer (and which computer it's on!). I know that I have a "hard copy" saved, so I can always re-type it if needed. If your kids are still in school (our local school still is), this would make a cute end of the year gift for their teacher. You could fill it with Hershey's Kisses or Tootsie Rolls (which is what I had in mine - before I ate them!). This would also be a great back-to-school gift for next fall. No, I'm not wishing summer away - but sometimes we need a little more time to plan our projects, right?